When preppers start looking for a good bug out location, the main feature they care about is “not in the city.” But what about other features? You don’t want to go just anywhere after the SHTF. You want a location that is safe and well hidden, among other things. That is the subject of this video by Black Scout Survival. 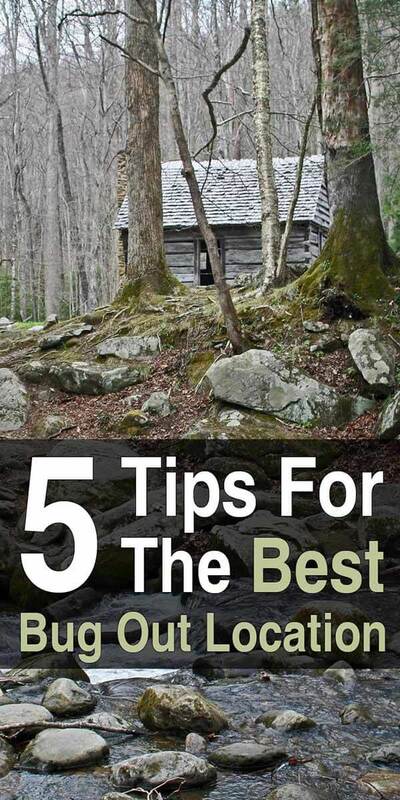 Here are his tips for choosing a bug out location. 1. Security – How defendable is the location? Are there roadblocks to stop intruders? Are there exit routes? 2. Camouflage – It needs to be a building that isn’t easily seen from the road. Something deep in the woods that blends into the background. Consider planting trees or adding cammo netting. 3. Water – Is there a natural source of water nearby? Or a way to catch rainwater? 4. Hygiene – Is there a way to keep clean? Are there showers? 5. Shelter for all Seasons – Will it keep you warm in the winter and cool in the summer? Watch the video below to hear his thoughts on these bug out location features. Make sure you own the land you plan to BO on. I agree on all points, Roland’s #6 is important too, and this must be non view-able to the outside world including 4 legged critters. Not living on your own but having a “community” of several families is also wise. Work can be shared and instead of being an “expert” at all things, farming, building, mechanics, health – yes you may get sick or injured, and maybe most important, way to guard the property could be shared. My 5 cents,we don’t have pennies.lol lmao also. The “Five Things” sound like short-term criteria, like someplace to go if you lived near a hurricane coast. In such cases, you’d only be there for a week or two. MREs or Mountain House meals would suffice to tide you over. But, in temporary evac sites, would you need camouflage and roadblocks? If society collapsed enough that you need to block roads and defend the property, there won’t be any more grocery stores. Maybe the list needs a #6: Capacity to supply sustainable food. Long-term, food might be more important than a shower. If you’ve got water, you’ve got hygiene.